Ho, ho, ho! It’s that time of year again! The time of family, friends, food and presents! The holiday season is a time of peace and love, and a whole lot of stress. After all, you have a ton of shopping to do! You need to get presents for everyone, and this requires lots of thought and effort. You need to come up with all your gifts, go out and buy them, wrap them, and deliver them (and hopefully get a gift in return!) We have a little suggestion for you about picking out presents. Some of the best gifts you could possibly give someone are products that help them with their at-home skincare regimen. The products we’re talking about today are some of our best sellers and can make excellent presents for friends and family this holiday season! (Or you could buy them to give yourself a gift!) Every product is developed by Trilogy Laboratories and has Dr. Flaharty’s official stamp of approval. In fact, we use many of these products in our own Medical Spa. So, let’s take a look at Azul’s skincare holiday cheer! As we age, we start to lose both collagen and elastin under our skin. Collagen is what keeps our skin looking plump and firm, while elastin keeps our skin tight and youthful. When we generate less collagen and elastin, we start to develop wrinkles and drooping. Add to this general wear and tear of time on the surface of the skin and we can look old before our years. Our Exfoliation Lotion uses a 5% glycolic acid solution to exfoliate the surface of the skin, while bio-engineered copper complex proteins penetrate through the pores to help stimulate and rebuild collagen and elastin production. It’s perfect for all skin types and, once your skin is used to it, you can move up to the 10% Glycolic Acid version for even better results! Aging, dry and sun-damaged skin can seem like facts of life when you live under the hot Florida sun, but they don’t have to be. Our Growth Factor Renewal Cream is Azul’s most potent anti-aging moisturizer, designed to accelerate tissue repair and build skin immunity. This cream includes growth factors and antioxidants that help protect from free radicals, accelerate cellular turnover and assist in re-texturizing your skin. It’s a skin-quenching moisturizer and anti-aging treatment, all in one! Speaking of the Florida sun, even though it’s the middle of winter, those UVA/ UVB rays can still pack a wallop. These rays can damage our skin health, leading to a prematurely aged appearance. This is one of the reasons that using an effective sunscreen year-round is so important. Azul’s Satin Eclipse is both a super-protective tinted sunscreen and a hydrating skin primer! It not only protects your skin from UV rays and infrared light, but also protects, moisturizes and repairs your skin with slow-release vitamins C and E. And to give it a satin finish, it also contains micro-silicone particles. Stripping your makeup off at night can be a huge chore, and one that often isn’t very good for your overall skin health. It can be drying and irritating, leaving you with a red face as you settle down for bed. Our Botanical Cleanser with Green Tea can help with this. It’s gentle and mild, using botanical-based foaming gel cleansers to clean your skin, rather than strip it of its natural oils. Its non-drying formula contains light alpha and beta hydroxy acids and natural botanicals that allow for gentle exfoliation, while vitamin C and extracts of bilberry, orange, lemon and green tea help nourish the skin. It’s perfect for all skin types! OK, it’s time to bring out the big guns! Azul’s Anti-Aging System is our most transformational skincare treatment. It’s designed to fight against signs of aging by boosting collagen and elastin production to restore your skin to its former youthful appearance. This package of five products includes the Growth Factor Renewal Cream we talked about above, along with our Rejuva Gel Cleanser Glycolic Acid 10%, Vita A Serum with Peptides, Dermal C Serum and our Enzyme Polish. This mix of products works synergistically with each other to provide an astonishing at-home skin rejuvenation. And the entire system also makes a fantastic present! We offer a starter kit so you can try everything first, and here’s the best part- you can apply the purchase price of the starter kit to the full size product kit using a code we provide in the package. A no-lose proposition! No matter what holidays you celebrate, the end of the year should be a time for festivity and fellowship. Giving presents is the perfect way to show the people in your life how much you care about them. With Azul SkinHealth products, you can provide them with not only a gift for under the tree, but also the gift of excellent skincare. These are just five of our best-selling products (we have tons more), and each one would make a fantastic holiday present! All of our at-home skincare products can be augmented with a visit to our Medical Spa. There, we can really give you specialized skincare, focusing on your specific issues and addressing them with treatments like a HydraFacialMD or microdermabrasion. If you’d like to book an appointment, give us a call at (239) 415-7576. 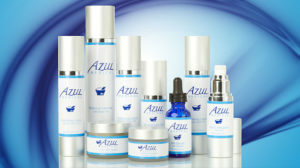 If you’d like more information about Azul, please visit our website at www.azulbeauty.com, or learn more about Azul SkinHealth at www.azulskinhealth.com. With our Azul SkinHealth products, you will have a beautiful and healthy glow to go along with your holiday spirit!